We are a small 501c3 non-profit organization, based in the San Francisco Bay Area. We mostly consist of two (unpaid) staff and a generous group donating their time as our Board of Directors. We are currently recruiting board members. Please let us know if you are interested in being involved. SAR^3 is Tom's baby because he has been nursing the idea of a rope research non-profit for years. Tom attended the University of Washington and earned four bachelors degrees (Geology, Biochemistry, Cell Biology, and Evolutionary Biology), then attended Washington University and earned an M.A. in Geobiology. He spent two years teaching and tutoring in the Seattle area before going back to graduate school to earn a Ph.D. in Earth Sciences and a Certificate in College Teaching at Montana State University. Throughout this process he realized how his cognitive skills could be utilized to benefit those working at height (fire/rescue personnel, rope access technicians, etc.) to improve their safety. So he started a research program to generate data that could be utilized by the professional rope user. His results have been presented at the International Technical Rescue Symposium and MRA/NASAR annual meetings, where he champions the use of data and critical thinking to determine the safest methods to use. In addition, Tom seeks to help others use data-driven teaching and learning techniques to improve their professional practice. Tom also volunteers as an instructor for the National Cave Rescue Commission, and volunteers with the National Speleological Society. To contact Tom, e-mail him at cavertevans@gmail.com. Sarah is currently working at Stanford University as the Director of Community-Engaged Learning in Environmental Sustainability, which has little to do with her interests in technical rescue! Stanford is actually Sarah's alma mater; she graduated with a B.S. and M.S. in Earth Systems. Sarah grew up in Arizona, and went to the University of Arizona for a PhD in Geosciences. While in graduate school, she joined the Southern Arizona Rescue Association (SARA) as a way to get outside and maintain her medical certification (at that point, a Wilderness First Responder). Recently, she attended the National Cave Rescue Commission's Level 3 training, and has remained involved in SARA's annual cave rescue training. Sarah picked up an EMT certification in grad school as well, which she is now using to volunteer with local EMS and the Mountain View Community Emergency Response Team in California. Sarah is so excited to be involved with SAR3 and to have the chance to put her academic experience to good use teaching and doing research in a field she finds fascinating and fulfilling. For more about Sarah, please visit her website. Sarah can be reached at sarah.truebe@gmail.com and 650-804-5413. Bonny Armstrong is a graduate of Western Michigan University with a master's degree in geology. Since 2005, she has been employed by the U.S. National Park Service and currently works in the Resource Management Division at Timpanogos Cave National Monument. A Life Member and Fellow of the National Speleological Society (NSS), Bonny serves on several NSS committees including the Safety and Techniques Committee, and several past and future NSS Convention Committees. Bonny has also been the editor of American Caving Accidents since 2011. After helping to rescue two different friends in separate caving incidents, Bonny is committed to helping others learn safe rope skills and basic cave rescue techniques, especially rope rescue skills using minimal gear. Recently she became a National Cave Rescue Commission instructor as well. Bonny can be reached at bonnyarmstrong@gmail.com. Hester is a caver and artist passionate about cave conservation. She has attended many cave rescue trainings (NCRC level 3), and participates in local training when possible. Professionally she is a lawyer with decades of experience. Her heart is in art, so she spends as much time as possible painting while underground. Her cave art portfolio is extensive, as is her support of safe rigging decisions based on evidence and critical thinking. Andrew works as a Paramedic for the British Columbia Ambulance Service based on Vancouver Island. 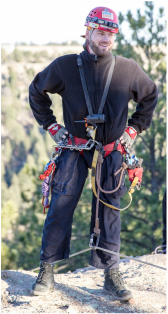 He also works as a technical rescue specialist in both the high angle and confined space environments. He grew up in the flat lands of Ontario, Canada and started a career as a white water rafting guide on the Ottawa River. He then went on to be certified with the ACMG in 2005 and teach caving and climbing at Horne Lake Caves Provincial Park. In 2008 he moved to New Zealand and spent the next 5 years teaching caving and rescue in Waitomo, home of the glow worms. He currently serves as the medical committee chair for the Alberta & B.C. Cave Rescue Service. He also sits on the British Columbia Search and Rescue Association Medical Direction Committee. He believes strongly in evidence based practice and is excited about helping usher this trend into the rescue sphere. He is certified with NFPA, IRATA, SPRAT, EMALAB, and the ACMG in various disciplines, is crazy about all things rope and can be reached at: augustus.andrew.munoz@gmail.com. SAR﻿^3 began when Tom and Sarah decided, after countless years of graduate school in earth sciences, they didn't want to pursue professor jobs and instead wanted to do what they love --technical rescue. Instantly, SAR^3 was born. Ok, it wasn't totally instantly. But, both founders love teaching, research, and service (the three tenets of traditional academia), and wanted to change the setting to one where they feel more at home, underground and/or on rope. We're starting small, but we hope to have a central training facility, eventually, where users can interact with us in person as well as online. In the mean time, we're happy to run teacher training with your rescue organization. Contact us to learn more!